A few weeks ago, I was asked by 13Thirty Cancer Connect to be a part of their annual gala. It was a beautiful night of the Rochester community coming together to support the organization and listen to our stories as teens and young adults who have gone through the unthinkable. I narrated the presentation titled “Cancer Can’t Mask Me”; a montage of audio clips, “masks” we wear in our cancer journey, and introducing our real selves to the crowd as the men and women behind the masks: raw and vulnerable, but strong and thriving. We finished the evening with everyone joining me to sing Jimmy Eat World’s “The Middle” (of course! ), and it felt like such an amazing moment of victory and fist-shaking in the face of disease and brokenness. On October 17th, I had my one-year PET scan. There is something we survivors in remission have dubbed “scanxiety”, and I was feeling it. I had a peace deep down that, no matter what the scan was going to find, I’d be okay. But the needle in my arm, the sound of machine whirring and beeping as it searched my cells for abnormalities- I couldn’t help the “what-ifs” swirling around in my brain. What if I was wrong to fight alternatively? What if It comes back? What if I have to go through surgery again? What if…? And the results came back absolutely CLEAR and NEGATIVE for cancer! I rejoiced. I felt so exhilarated and on top of the world. To know that my body was healing, healthy, and whole. That no matter what this life throws my way, I can say that I once stared Death in the face, and with the strength that only God can give, I came out victorious! But with every high comes the gradual descent. And just a week later, I was sitting up alone one night, staring at the wall, wondering what in the world do I do now? For the past year, my “identity” had to do with my cancer. I was fighting. I was healing. I was being an example for others. I was processing and rising above the chaos, learning who I was in this “new normal”. But now, praise Jesus, I had the green light of freedom and closing that chapter, ready and able to move on to the next season. So, why was I feeling so lost? I think identity-crisis hits us multiple times in our life. But I was reminded that night that my identity isn’t rooted in my circumstances- because they change in an instant. 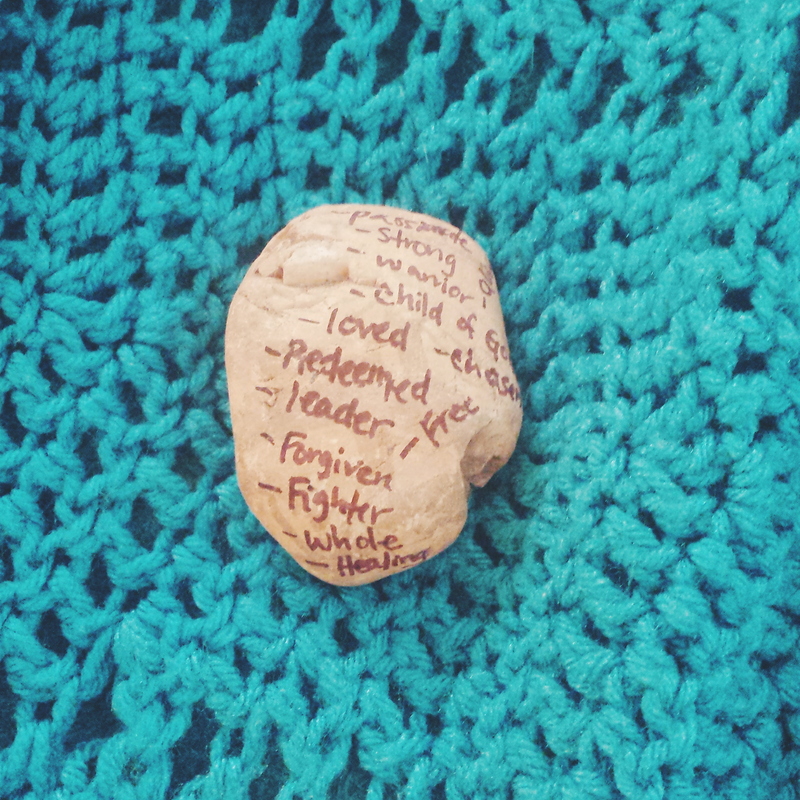 On my windowsill is a rock from the riverbed in Tarkio, Montana, where I had written all the things that I know in my head about myself, but don’t always remember in my heart. I picked up that rock and cradled it in my hand that evening, rereading what my August self had proclaimed at the river: Chosen. Redeemed. Alive. Free. Passionate. Child of God. Warrior. Whole. THAT is my identity. Firmly rooted in Christ, and not based on situation, disease, relationship, or the opinions of others. My purpose and my journey are being used by God for His glory, and my promised good. I can hold on to that with certainty, with expectation, and with peace that passes all understanding. Cancer will always be a part of my story. It doesn’t define me or mask me, but it will always be something that changed me- literally and figuratively. It’s hard to explain this to people- “But you’re cancer-free! You’re fine now!” I wake up every day with a dry mouth and a half-numb tongue, a sore and muscularly dysfunctional shoulder, scars and nerve-damage to remind me of that battle. Yes. I fought hard. Yes, I came out victorious. Yes, I can move on with my life in joy and embracing it fully, praising God for every new morning He gives. But I can’t ever forget what I went through or act like cancer didn’t affect me deeply and forever. Because it did. It indoctrinated me into the world of cancer-survivorship, beautiful experiences that are only available to those who have faced the unimaginable at such a young age (First Descents, Athletes 4 Cancer, 13Thirty Cancer Connect, etc), support from so many different organizations and people who GET it, and a forever altered sense of what really matters in this life – feeling deeply, loving to the fullest, and embracing every day with brand new eyes to the blessing all around me. Yes, I live a “new normal” these days. But I cannot wait to see what the next chapter holds…because I know the One who is writing it has great plans for me. You… my friend… are remarkable!!! His plans for your future are full of hope! Walk in that understanding and continue to love and live life deeply! You inspire me and many others!! !